What is the USPS Metered Mail Rate? 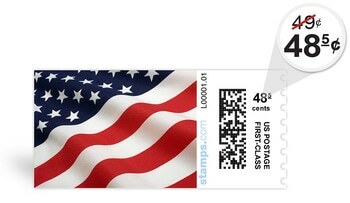 In January 2014, the USPS® introduced a new Metered Mail category for single-piece letters with postage printed using a PC Postage provider (such as Stamps.com) or a postage meter. The Metered Mail rate is currently $0.50, a five cents discount off the retail rate of $0.55 for First Class Mail Letters (1 oz.). The special metered mail rate was introduced to encourage the use of metered mail by small businesses. Metered Mail customers cost the USPS significantly less compared to those acquired from other sales channels. Not only do these customers avoid retail locations, but also their mailpieces are already bar coded and addresses pre-cleansed. For small businesses sending out single-piece letters, using Metered Mail is a valuable money-saver. The five cents savings adds up and there are no mailpiece minimums. You can simply print your postage online, affix your postage and drop your letters in the mail. The new Metered Mail rate is automatically applied for Stamps.com customers. Access to all the mail classes and delivery services of the USPS, including exclusive online postage discounts for packages. 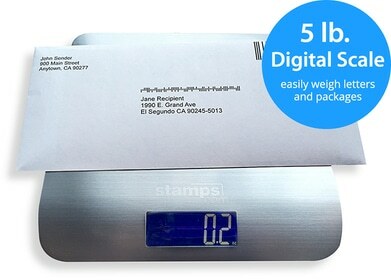 Using the Stamps.com USB digital scale to weigh each letter for the exact postage, ensuring you’re never over-paying for postage. Complete visibility into your monthly postage spend with detailed reporting.